Kerrang! is a British weekly magazine devoted to rock music and heavy metal music, currently published by Wasted Talent (the same company that owns electronic music publication Mixmag). It was first published on 6 June 1981 as a one-off supplement in the Sounds newspaper. Named after the onomatopoeic word that derives from the sound made when playing a power chord on a distorted electric guitar, Kerrang! was initially devoted to the new wave of British heavy metal and the rise of hard rock acts. In the early 2000s it became the best-selling British music weekly. Kerrang! was founded in 1981. The magazine commenced publication on 6 June 1981 and was edited by Geoff Barton, initially as a one-time supplement in the Sounds newspaper, which focused on the new wave of British heavy metal phenomenon and on the rise of other hard rock acts. Angus Young of AC/DC appeared on Kerrang! 's first cover. 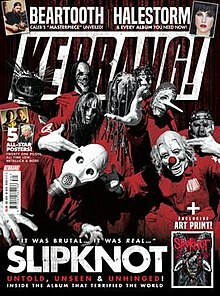 Launched as a monthly magazine, Kerrang! began to appear on a fortnightly basis later, and in 1987 it went weekly. The original owner was United Newspapers who then sold it to EMAP in 1991. During the 1980s and early 1990s the magazine placed many thrash and glam metal acts on the cover (like Mötley Crüe, Slayer, Bon Jovi, Metallica, Poison, and Venom) but later discarded them when grunge acts such as Nirvana rose to fame. Readers often criticise the magazine for repeating this process every time a new musical subgenre becomes trendy. The term "thrash metal" was first coined in the music press by Kerrang! journalist Malcolm Dome while making a reference to the Anthrax song "Metal Thrashing Mad" in issue number 62, page 8, published on 23 February 1984. Prior to this Metallica's James Hetfield referred to their sound as power metal. Kerrang! 's popularity rose again with the hiring of editor Paul Rees circa 2000 when the nu metal genre, featuring bands including Limp Bizkit and Slipknot, was becoming more popular. Rees went on to edit Q magazine and former Kerrang! reviews editor Ashley Bird was appointed editor from 2003 to 2005. Following his departure, Paul Brannigan took over as editor in May 2005. With the emergence of emo and metalcore during the mid to late-2000s, Kerrang! began to heavily feature this musical trend. The revamp was not welcomed by all readers and many complaints were received about Kerrang! 's sudden emphasis on emo and metalcore music. However, following this change, Brannigan took the magazine into its most commercially successful period with a record ever ABC for the title of 80,186 copies. In 2008, EMAP sold its consumer magazines to current owner Bauer Media Group. Brannigan left Kerrang! in 2009 and Nichola Browne was appointed editor. She later stepped down in April 2011. Former NME features editor and GamesMaster deputy editor James McMahon was appointed as editor on 6 June 2011. In April 2017, Kerrang! magazine, its website, and the K! Awards were purchased by Mixmag Media, publisher of dance monthly Mixmag, along with assets related to defunct style magazine The Face. Mixmag has since formed parent company Wasted Talent, which relaunched Kerrang! as a digital-first title, while continuing to publish a weekly print edition. Former Editor-in-Chief Phil Alexander was appointed Global Creative Director on 3 August 2017. Bauer retained ownership of Kerrang! Radio and the Box Plus Network will continue to operate Kerrang! TV as before. The magazine received a logo change in mid-2017 before receiving a complete redesign during 2018. This change saw several of the magazine's long-running features dropped, including the Ultimate Rockstar Test, while new features were added in their place. In March 2018, following a magazine redesign, Kerrang! announced it would be expanding to the United States, with an office in New York run by Ethan Fixell. The goal would be to generate US-centric content, events, and brand partnerships.